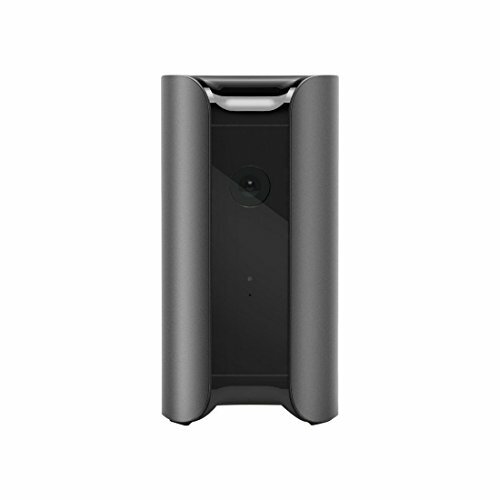 As smart home security cameras go, Canary has everything covered. There are some bugs that need to be ironed out, but otherwise it's the do-it-all discreet solution. What goes on in your house when you're not there? That's the question that Canary is here to answer with its £159 smart home security system. It sits at home and watches. It watches for movement and, should it sense some kind of tremor in the Force, it sends a message to your mobile phone complete with a captured video clip of the disturbance. Just like Google Nest and a handful of other home security systems. Its primary purpose is to catch burglars in the act but it's also been recording footage of what people's pets get up to when they're at work, the first steps of toddlers and all sorts of the more heart-warming end of home surveillance that you'd care to think of over at CaughtByCanary. But is Canary just another item of smarthome frippery? Does it make your life any easier? Does it solve any genuine problems? And does it do it better than its rivals? We became the fly-on-the-wall in our own living room to find out. Like most of the new wave of smart home products, Canary has been carefully designed not to look like a CCTV camera with its beady eye trained on you every movement. It's a 400g, 152.4mm-high cylinder with a diameter of 76.2mm (6-inch x 3-inch if you're old school) that's closest in appearance to one of its main competitors, the Netatmo Welcome, only with a touch more girth. All the same, Canary was a lot smaller than we thought it would be once we got it out of the box. Again, like the Netatmo, probably its best physical design feature is that it doesn't look like a camera at all - unlike fellow rivals Dropcam and Withings Home on which the lens is all too obvious. It's possible that a burglar would ID a Canary and remove it from the equation once on site but only because they'd know it by reputation. To the uneducated eye, it passes as a Bluetooth speaker or some kind of AV box. You get to choose from black, white or silver. Setting up a Canary is gloriously simple. It's a tiny bit more involved than plugging it in and turning it on but you're looking at about five minutes at the most. Download the Canary app for either Android or iOS - sorry, no Windows Phone or BlackBerry (does anyone still use one?) - and it'll walk you through the process that Canary was good enough not to waste the paper on. It runs a bit like this: Put your Canary somewhere it's going to see people who walk into your house and try to take stuff. Bad places include: the toilet, airing cupboard, under the bed, in the attic. Good ones would be central rooms, big rooms, rooms with your expensive items in them. In a classic Victorian terrace, you're probably looking at the living room, the kitchen or the hall. Mansion-dwellers will be pleased to note that you can connect up to four Canary units to the same account/app. The camera has a 147-degree field of view, so you'll be able to capture most of the action wherever you plonk the Canary. Do be mindful of the fact that the camera is fixed, though. There's no tilting or panning, so sticking it on the floor or mounting it on the ceiling is not only impractical but also a little pointless. On the back, you'll find a micro USB port and in the box a cable to match with a three-pin adapter on the other end. Congratulations, you now have power. Then take out the second 3.5mm-like wire. One end goes in your phone, the other in the Canary. They talk to each other, they swap Wi-Fi details, make plans to go bowling together via some kind of audio communication that no one really needs to understand, and you're done. You'll never need that second cable again. Put it back in the box/the bin/your drawer full of tangled wires as you see appropriate. Finally, you'll want to send invitations to other members of your household whom also have smartphones. Once they get the app installed too, they'll be recognised as friendly and also have access to the alerts and live video stream as needed. Cushty. Canary is always watching but it's not necessarily recording. That means that you can tune into a live feed at any moment you wish but it's not going to fill up its server space with hours and hours of blank footage of your sofa. When Canary senses motion, it starts recording and those clips will be kept up in the cloud for a minimum of 12 hours for you to view as you need. That increases and starts allowing unlimited video downloads too once you upgrade to a paid, monthly plan. More on that later. Although Canary has an excellent microphone - so good that it's been used to identify and arrest burglary accomplices on the other end of mobile phone calls - audio will not trigger recording. It's strictly a motion affair, and we've had no reason to have issue with that in our testing. The only real problem - like with all of these devices - lies in the false positives. Shadows moving across your wall at night as cars pass by your windows will set it off. So will an insect flying by - but at least that can make for a nice little clip. You can tag each recording with what kind of movement has actually occurred - people, shadows, pets, reflections, flickers from your TV screen - and, over time, Canary is supposed to learn and get more accurate. It didn't, but then it's early days and Canary will need to process a lot of that data before it gets really smart on that front. So, is that a problem? Well, maybe. Canary knows where you are by tracking any phones connected to the account, and it actually does it very well indeed by using a combination of Wi-Fi, GPS and straight cellular activity. When none of those phones are home, it arms itself, and when it's armed, it will send a notification to those mobiles with clips of whatever activity it's detected. So, false positives aren't a big deal during the day. You take a quick look, you see it's your dog and you get back to your doings. What if you're on holiday and you're trying to get some shut-eye, though? You get an alert, you sit bolt upright in full impotent action mode, watch the video and then discover that a car has just driven by back home. Now you can't get back to sleep and, even if you can, how many times do you want to be woken like that? How often does that need to happen before you begin to ignore the alerts altogether? Ultimately, though, perhaps that doesn't really matter. The most effective use case of Canary is that you end up watching a burglary unfold while it's actually going on. You then get the choice of sounding the device's 90+ dB alarm, which, we can confirm, is ear-splitting, or you can call the cops to wait on the street patting their truncheons into their palms before they catch the crooks - swag bags and all. But, even if you don't happen to react to the alert for whatever reason, you'll still have the crystal clear recordings of what happened which will almost certainly lead to a conviction even if you don't end up with your stuff back. Just for the record, the 1080p quality is bang on, the night vision mode is terrific and police both sides of the pond are big fans. That's the main sell of Canary, and it's a good one. Now, as it happens, Canary also keeps a note of all the motion-triggered moments that take place even when it's disarmed, such as when someone with the app on their phone is home. So, for example, we woke up in the morning to an amusing scene on our mobile phone of Mrs Pocket-lint coming in during the small hours after a night out with her friends; a little staggering, a scoffed packet of Frazzles and a very amusing video sitting on the timeline. If you don't like the idea of Canary shooting 24/7, then you can put it in Private mode but then that might beg the question from your partner: “Why did you put it in Private mode?” We'll leave you to deal with that one - but the point remains that the feature's there. Aside home security, Canary is also packed with a clutch of sensors for what it calls HomeHealth. That includes temperature, humidity and air quality, the last of which comprises of a score based on individual - but hidden - measures of isobutane, hydrogen, carbon monoxide, cigarette smoke, cooking odours, methanol and ethanol. Our living room had a humidity of between 60-70 per cent and air quality that was generally classed as "normal" which generally prompted the question, “And?”. Sure, that might be an issue if you have a CO leak or if you're at levels of humidity that will encourage mould or damp but, to be honest, you'd probably know about that before Canary did anyway. The real point here are the future features that lie within: when Canary feels the time is right, there's space for this thing to act as a thermostat, a smoke alarm, a carbon monoxide sensor and something useful we'd love to tell you about if we had any knowledge of isobutane. It's one the constituents of camping gas and is also used as a refrigerant. We just looked it up. Despite all this potential, though, there's currently absolutely zero Canary link-up with any other smart home device; no ‘works with Nest', no IFTTT, nada. For us, that's not really a problem because the bigger picture is that Canary wants to have full control of its experience to make sure that it's absolutely bang on. The cynical flipside of that is that the company wants to keep you in its ecosystem but we'll give Canary the benefit of the doubt for now. Canary review: Is it safe? Congratulations, you've just purchased something that streams video of you and your loved ones up to its company's servers. How do you feel about that? Well, this might be a moment when you're glad that Canary isn't owned by Google (yet) and doesn't tie-in with any other products. The company CEO has a background in military intelligence and your information is protected by 256-bit encryption. If that doesn't put your mind at ease, then we doubt anything will. Apple-like is an expression used far too often but, with Canary, the description is justified. From the installation through to the app, it's a pleasure to use. You don't get any kind of web access to your videos but, frankly, who needs to? That phone software is sound with a very neat timeline of all your clips that you can search for by date, by mode, when they were recorded - and you can bookmark them too. Then there's the graphs of all the temporarily pointless HomeHealth information. Our only complaints are that sometimes there's a bit of buffering to sit through before you can view your recordings or access the live stream - but it never fails and the quality of what you get is great. For the other issue, it's that we didn't want our Canary's notifications to fall silent when we switched our phone into no sound mode. Ok, maybe it's no good to be disturbed during a meeting if you're mum's trying to call for details of what colour socks you'd like for Christmas, but if there's some hood unscrewing your TV from its multi-positional wall bracket, that's probably worth leaving the room for. In the current continuum of smart camera cost, Canary sits somewhere in the middle. None of the video storage is on the device itself which is really the only credible solution given than you don't want a burglar bagging your device and walking off with the only evidence you had. The downside of a cloud service means that customers end up paying for the rental of small bits of online space to call their own. For two days of timeline and unlimited video downloads, it's $4.99 per month. For seven days, it's $9.99 per month. And if you really think you need 30-days then it's $29.99. Fortunately, unlike with Nest Cam, there is a non-subscription that you might just get away with. There's no video downloads - bit of a bummer - but you do get a 12-hour timeline. That's rather cutting it fine but it's still perfectly possible to get the evidence to the police in time. Ok, so you might then have to take a video of the video if you want it for keeps but it's an option. Realistically, though, the $4.99 is where to head. We're not going to sit here and talk about whether it's fair or if it's a proportionate cost. What we are going to say is that paying yet another subscription - no matter what for and no matter how much - is hard to stomach. Home security is not an easy sell. Throw in an on-going additional benefit and it might just tip the balance. We trust Canary. That's the bottom line here. There's a lot about it that really feels like "the one" as smart home security goes. It doesn't have the face recognition technology that Netatmo's added on to Welcome but we're not sure it really needs it. The app, the experience and everything about Canary is just, well, right. You feel it in your bones. So much of the smart home is full of gadgets with promise that turn out to be creaky once in action and that's not the situation here. There are issues though. That learning mechanism needs to kick in to avoid the regular false positives. The notifications really ought to break through when one's phone is set to silent and it really wouldn't cost Canary anything at all to let you download videos without a subscription. All the same, it's hard to ignore the fact that this product is a winner. It can keep an eye on our home any time.